Home / health guide / First aid for sunstroke. 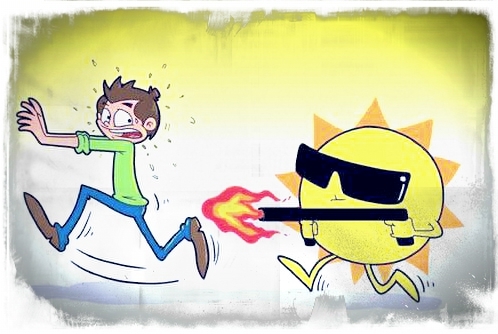 Exposure to the high temperatures of the sun can lead too numerous health complications, ranging from simple cases such as light blackout - the rash - muscle contractions that may be caused by lack of sodium in the body to severe cases of heat stress and the sun that lead to dizziness - lack of focus - difficulty in walking - disorientation - nausea - vomit and diarrhea - the deterioration of awareness - cramps - heart anomaly and in this case there is a rising of body temperature up to 40 degrees. The groups most vulnerable to injury are those who have sports in the sun or in the high temperatures or the patients who consume drugs such as: diuretics and the elderly or those who suffer organic diseases, such as diabetes and heart disease and thyroid. How to administer first aid? 1- Transport the injured to the shadow. 2- Let him sleep on his back with the legs up. 4- Cooling skin, put casualty in the cold water or put ice packs on the casualty's' skin. We must continue to cool the body with cold water and ice pack to ensure casualty reaches a low temperature of 38°C and this is the most successful way for treatment where it's leading up to a contraction aneurysm in the skin and cooling internal tissue and reduce the burden on the circulatory system. The casualty must also be given a large amount of fluids to ensure high rate of urine passage and efficient internal tissues and vital organs cooling.